Classic floor clock in antique walnut finish. Classic floor clock in antique walnut finish, with lockable door, moon phase dial with Roman numerals, etched 20 cm lyre pendulum. Kieninger 0143-23-01 - 0 Delivery about two weeks directly from Kieninger. SK 012 1/4 chain and weight Westminster & striking movement. Kieninger SK 012 1/4 chain and weight movement with an eight-rod gong. The Westminster chimes play on the quarters on four rods and the movement strikes the hours on four rods . 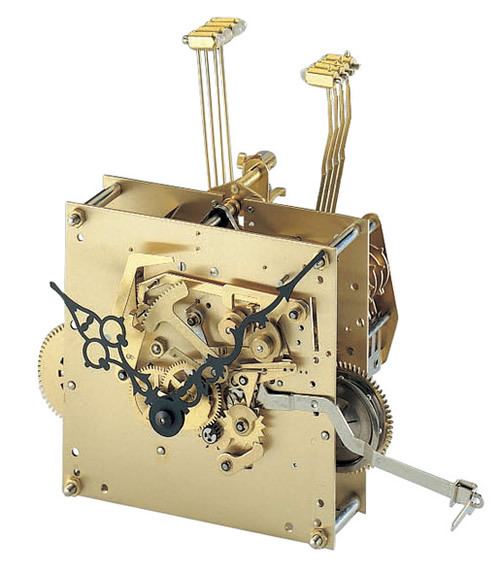 The movement has a single lever to provide selection of the Westminster melody or Silent and is also has automatic night silencing between 10 PM and 7-15 AM. Kieninger specify a lubrication every five years and a clean and lubrication at ten yearly intervals; following this advice will ensure excellent reliability and an extremely long life! Oakside now provide servicing and repairs but you may also find a BHI recommended clock service business by opening the Menu Link to Kieninger Manuals and Interesting Links. Click here to view the Kieninger 0143-23-01 Options and Prices page.